If you have a backyard area that you’re looking to turn into a personable living space you have two main options. The decision to convert the area into a patio or deck is packed with endless considerations, and each option has its natural benefits and drawbacks.We recommend that a specialist thoroughly review the area in question so that an unexpected disaster down the road doesn’t compromise your investment. Durable Materials for the pathways and structures of a patio are their overwhelming advantage. Different types of stone, concrete and brick come in a variety of designs and colors. The downside is that these materials are expensive and require a lot of labor to set. Heavy Loads, like a hot tub, furniture, or large grills, pose no structural integrity problems for a patio. The Surrounding Nature can be charmingly incorporated into a patio, but weeds and other undesirable plants can impose. Patios also attract more wildlife activity. The Height Advantage of decks makes them an excellent solution to low lying yards, which can get soggy annually, and invasive plants. Their elevation also makes them an easy choice for owners of yards that are composed of rough terrain that would cost a fortune in manual labor to excavate. A Variety of Materials is also an upside to decks. Hardwoods are the traditional choice, Redwood in particular offers a smooth natural look that is sturdy and long lasting, but new materials like TimberTech composite and vinyl hold up better over time and don’t attract as many insects. Concrete decks are available and last longer, but come at a premium. Endless Design Possibilities are available with decks from walk around layouts and multiple-story setups to decks that cater to large groups, hot tubs and grills. With the many considerations this choice often comes down to: aesthetic tastes and cost. 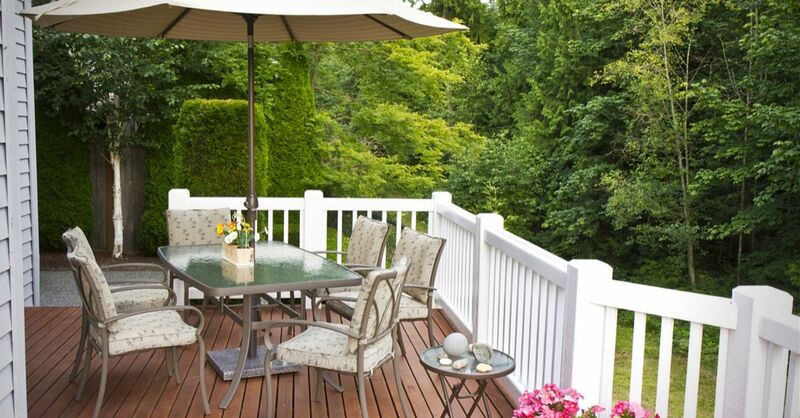 If your backyard dreams come at a budget, a beautiful deck can be a great choice. A myriad of design options guarantees that it will be a lively area and the distinct materials can cover your durability concerns. Contact our team at Straight Line Construction. We build custom decks in Sacramento and surrounding cities to suit your exact needs.